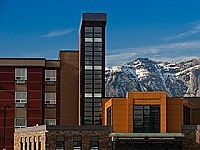 Travelers have a lot of choices in Canmore and we want to help you choose the best accommodations for your needs, budget and taste. Our accommodation listing includes romantic inns, affordable motels and lodges and full service hotels. Your Basecamp of the Rockies is located at the intersection of the Trans Canada Highway #1 and Kananaskis Trail Highway #40, the Gateway to Kananaskis Country and the Canadian Rocky Mountains, 30 minutes west of Calgary.